The Vanguard Total World Stock Market ETF returned nearly 19% the last 12 months and 27% over the last 18 months [this was written regarding returns ending Sept 2017]. Even Vanguard’s LifeStrategy Moderate Growth Fund was up just under 11% and 17%, respectively, despite having only a 60% allocation to equities. I’m sure your portfolio is up, too. Is it time to adjust your financial plan? The short answer is no…well, at least not very much. For the most part, as asset prices in your portfolio go up (or down), your expected future returns will go down (or up). As such, you’ll likely end up in the same position 15 years in the future. The longer answer is below. I break the answer into 3 sections. The first section introduces and argues for the simple but powerful concept of the “4% rule” for withdrawals. The second section covers the concept’s implication: your financial plan has much more to do with you (specifically your spending) than with your investment advisor and requires flexibility. And the third and last section outlines the steps you should take, always, to make sure your plan addresses not just your retirement but also your death or possible health challenges. The 4% Rule is as simple as it sounds: a safe real withdrawal rate over retirement should be 4% of your investment portfolio. In other words, if you’d like to spend $200,000 in inflation adjusted dollars a year in retirement, you should plan on saving $5,000,000 or 25 times your spending rate. Four percent wasn’t picked out of thin air. In fact, it was calculated as a “safe” withdrawal rate by William Bengen back in 1994. He showed that retirees with at least 50% invested in equities could historically have withdrawn in real terms 4% of their initial savings without fear of running out of money. Since then, the test has been extended back to the 1870s and updated to include the tech bubble of 2000 and the 2008 financial crisis. 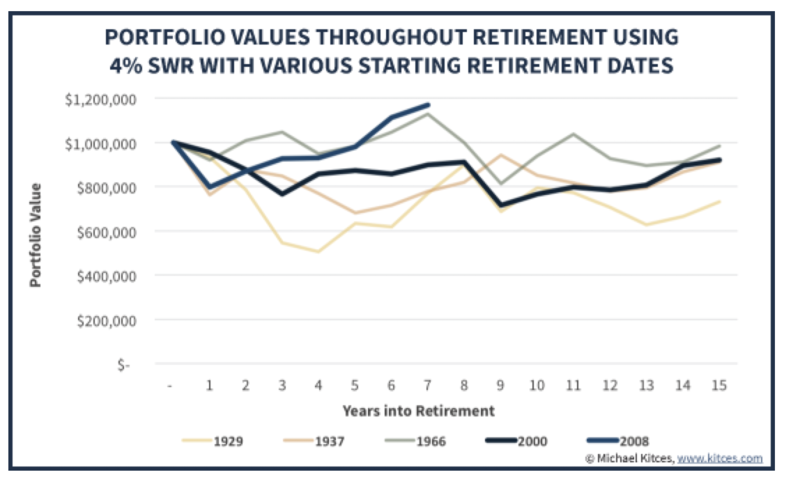 As seen below in graphs calculated by the financial planner and writer Michael Kitces, the safety of the 4% rule has held up very well for those with a moderately aggressive portfolio of 60% equities and 40% fixed income. But given the huge amount of money left over for many hypothetical retirees, is this rate too conservative? Certainly, with hindsight it was and would be again if the returns we have all experienced over the last two years continue. Sadly, past performance isn’t a good predictor of future performance. With fixed income products like bonds currently at very low yields and stocks at very high price multiples (e.g., Price/Earnings ratios), future returns are likely to be much lower in the future than they have been historically. By how much? With equities, it’s hard to say, but it’s less likely to come from stocks getting even richer than from pure earnings growth. With fixed income, current yields do act as a reasonable guide to future returns. Historically, as measured by Vanguard, they have returned 5.4%. Sadly, today most fixed income benchmarks don’t yield much over 2.5%. Back in 2013, researchers published for Morningstar probabilities of success for retirees who use the 4% rule, but with fixed income performance ratcheted down to 2.5% (at least initially) and equities to 9.77%. This equity performance assumption is 2% less than the S&P’s historical performance but perhaps still aggressive given current high valuations. Global equities, by comparison, have averaged a nominal return of only 9.5% over the last 56 years of unprecedented global economic growth. In fairness, they also assume a 1% management fee which is much higher than you need to pay (at least with me!). Even with the seemingly aggressive assumptions for future equity returns, their results are more sobering. 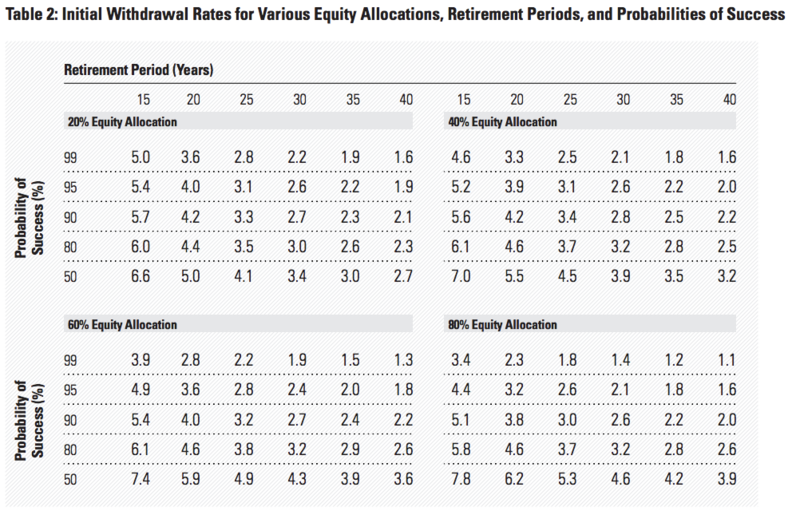 As their table below shows, the probability of success for an investor in a 60% equity portfolio employing a 4% real withdrawal rate drops from near certainty to closer to 50%. At first, the above table seems daunting. 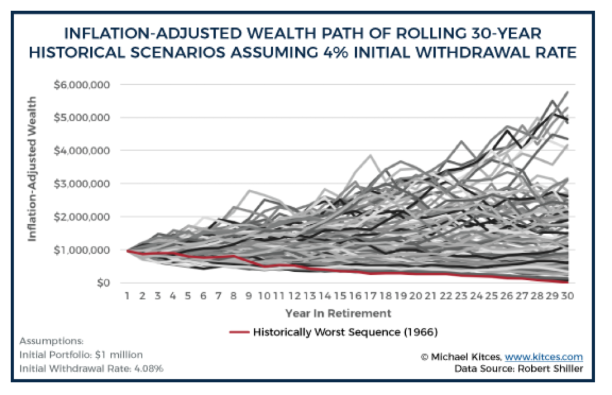 If you want a 95% success rate of enjoying retirement for 35 years, with a 60% allocation to stock, this research implies you should drop your withdrawal rate from 4% to 2%. In other words, you will have to double your savings goal. What this analysis doesn’t factor in is your ability and willingness to adjust spending and/or continue working. As Carl Richards, the author of “The One-Page Financial Plan” argues, you will have to learn to accept uncertainty. As unsettling as it is, the future is just too unpredictable. No matter how sophisticated the analysis is, all plans rest on some rather dubious assumptions regarding future inflation, returns, volatility, correlations and spending needs. But that doesn’t imply you shouldn’t have a goal. 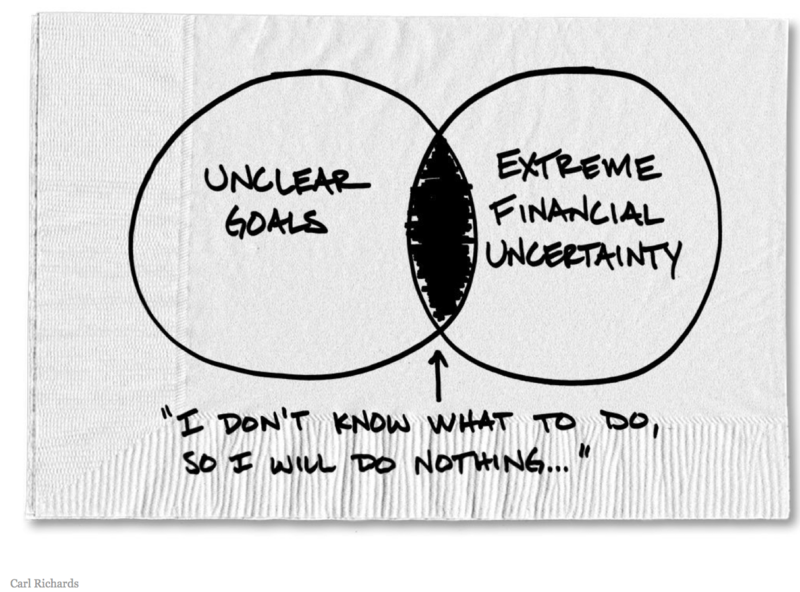 Without clear goals, you’re too susceptible to do nothing. The clearest action to take is to reign in mindless spending. A sustainable penny saved isn’t just a penny earned, it’s 25 cents less that you’ll have save in the future. In other words, applying a 4% withdrawal rate also implies that if you can adjust down your annual spending by $40,000 you will likely have to save $1mm less than you would otherwise. Or likewise, if you are falling short, find something that you love that you can do well into your 70s, even if it only makes you $40,000 a year. An investment advisor like myself should do part of that saving for you by keeping your investment fees and taxes as low as possible. A 4% withdrawal rate may in fact be too high if your spending 1% in fees and generating unnecessary taxes. Another high cost to investors is trying to time the market. Don’t. You can’t. My other primary role is to make sure you have a thoughtful, personalized allocation across assets, adjust that mix to reflect your life changes, and then stick to the plan. Lastly, don’t let your financial goals trump your larger goals like enjoying life. As much as we like to dream about retirement, we also like to avoid thinking of our own death or demise. This doesn’t mean you will have to go out and hire an estate lawyer. With portability, you can now bequeath free from federal estate taxes over $22mm as a couple (albeit not always state estate taxes). And often if your final wishes aren’t complicated, free online forms can suffice. Just don’t put off getting your estate in order. 1) Will and/or Trust with Guardianship Designations and Proper Life Insurance should you die early. To limit the potential for family infighting, try and mirror designations with how you bequeath the assets that pass outside of the will, like your 401K and IRA. Is your life insurance adequate for your family if they don’t have other income sources and need to employ the 4% rule? Luckily, term insurance is cheap. 2) Durable Power of Attorney and Disability Insurance should you become mentally compromised. The reality is that with advances in technology, we are less likely to die early but more likely to live a compromised life. A Power of Attorney (POA) gives an agent of your choosing the ability to make legal decisions on your behalf if you’re deemed by your doctor to be mentally incompetent. If you are unable to work, you’ll also be much better protected with disability insurance. 3) Health Care Power of Attorney and Long-Term Care Insurance should you become incapacitated. Somebody you trust should know your wishes for healthcare if you are unable to express them yourself. You may also want to lessen the potential burden and anxiety stemming from whatever long-term care you may require. For those who do want an estate lawyer or insurance specialist to help them with this process, you should. I don’t pretend to be an expert in these areas. I am a financial advisor and can only guide you, keep my fees and your taxes low and minimize risk through personalized diversification. The onus is on you to save, be flexible and expand your plan to include more than just retirement. Luckily the plan can also be simple. Now, just don’t extrapolate these recent high returns into the future!